[via inhabitat] Got a case of the Monday mornings? If you’re like millions of other Americans, a nice, hot cup of joe might be your go-to cure, but what about all of those paper cups that go to waste just so that we can get our fix? Well, one Harvard biomedical engineering professor, David A. Edwards, has developed a product that may make getting caffeine into your system a little more efficient – if not also more creepy. 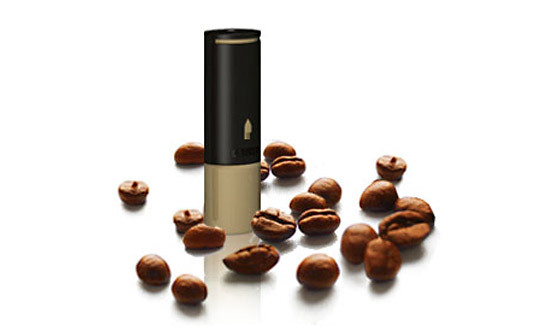 Called Le Whif Coffee, Edwards’ java jolt comes in a biodegradable container about the same size as a tube of lipstick, and is ingested by inhalation instead of drinking – a strong reminder of the narcotic nature of caffeine. We’re a bit critical of Le Whif since it still comes in one-time use throwaway packaging (the best option would be if we could get everyone in the world to use a reusable cups for their coffee) but we think the idea of an alternative method of drinking coffee is interesting, if nothing else. 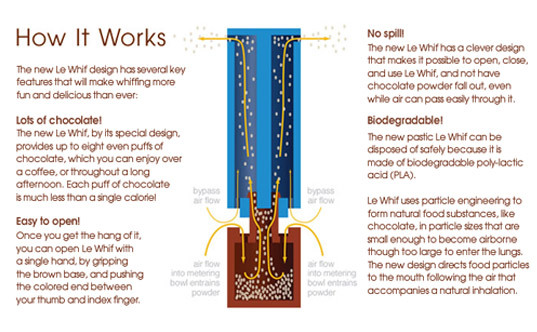 Le Whif is produced through a process called particle engineering, where coffee particles are decreased in size until they can be airborne. Then, those particles are packaged up in a tiny biodegradable canister that you can carry with you on the go. With about 58 billion hot paper cups used in the U.S. each year, Le Whif could theoretically cut down on waste if people opted for it instead of grabbing a cup at Starbuck’s and tossing it. But will Le Whif catch on? People drink coffee for the caffeine, but they also love the taste and ritual of sipping it. So again, we think the simplest way to reduce waste is for everyone to simply brew their own coffee at home or get a reusable coffee mug or cup, but we’re still curious about giving ‘Le Whif’ a sniff test. Le Whif is now available at Dylan’s Candy Bar in NYC and Cardullo’s in Boston as well as on the website if you want to experience it for yourself!